Download "Hall of Fame Nomination.pdf"
Vice President: Patrick Enochs, Chemical Pollution Resources, Inc. The purpose of the White Haven Chamber of commerce is to promote business and economic development, creating opportunities for strategic partnerships between businesses and community, bringing prosperity to our area. We rely on the vast knowledge, skills, and abilities inherent within our business community along with those of our government counterparts and community civic organizations to accomplish our goals. These strategic partnerships are essential to success as no single organization or function alone possesses the capability to create all necessary change important to our areas economic growth and prosperity. Our first focus is business – preserving business, enhancing business, and expanding opportunities for growth of business. When businesses thrive, communities prosper. We recognize inaction erodes the public’s trust and, more disturbingly, our future and that of future generations. To this end, the Greater White Haven Area Chamber of Commerce has established the position of Director of Business Development and Incentives. Our Director of Business Development and incentives is tasked to develop a vision, plans and most importantly, act with a sense of urgency to get things done on behalf of the people of White Haven and the surrounding areas. 11. leverage our non-profit status to promote and support business ventures. We firmly believe economic development is the engine that drives area sustainability. Therefore, we will find ways to bring new business growth into our community. We recognize empty and abandoned buildings have their own negative impact, lowering property values and perpetuating more empty and abandoned buildings. Vacant, and undeveloped commercial lots also pose squatting, vandalism, theft, insurance, and appearance issues. A large amount of business and property owners are sitting on commercial space that’s currently empty. Some of this stems from previous economic downturns, and personal or public disasters. Our objective is to promote revitalization of available commercial properties, a reemergence of the White Haven Main Street, and to bring business into the Greater White Haven area. 1. Annually, create a consolidated vacant commercial property listing to match potential business with properties. Contact all property owners to encourage business development and utilization. 2. 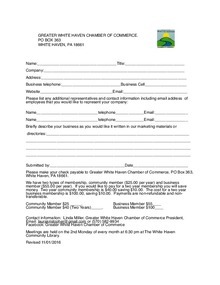 Annually, create a consolidated new business “WISH” list reflecting the business desires of the Chamber, local civic organizations, and local government agencies. The Chamber will then target and solicit these types of businesses to establish themselves in the area. Our 2018 business WISH list revolves around three categories of businesses – retail business, professional service businesses, and housing businesses. 3. We will establish an aggressive marketing campaign utilizing our website in-bound marketing, targeted mailings, and networking to solicit targeted businesses and markets into our area. 4. We will build a directory of available, recommended funding sources (banking, etc.) to incentivize new businesses. 5. We will join into a consortium with the Freeland Development Authority to identify and match prospective business owners to available properties. 6. We will work with business alliance groups, the Small Business Administration, State and Federal agencies to obtain available funding and grants for development of area business. Our attitude is that business opportunities abound. Our principle objective is to become a community business magnet, attracting entrepreneurship and business, successfully bringing prosperity back into our area. We resolve never to abandon this take-action spirit. Successful businesses fill a need, making people’s lives easier, faster, and more meaningful. Simply put, they add value to people’s lives. This must also be done while providing a product or service at the right price according to the area market. We recognize entrepreneurs, business owners, leaders and investors are a rare breed. Success is never guaranteed and rarely immediate. We must commit to supporting smart business, tailored to our location, with resources needed to help the business succeed. 1. We will establish an investment group, commissioned by the Chamber via charter, consisting of Chamber members – the newly formed Business Development Commission – used to develop business growth. The Chamber will own buildings, land and/or space to be developed and/or leased. 2. We will establish an investment fund that the Chamber can use to assist with capital needs of new and/or expanding area businesses. 3. We will seek out for-profit, private investors and private investment groups willing to invest in our area and match them to area entrepreneurs and business owners seeking capital. 4. We will establish a Business and Education Association as a 501(c)3 entity under the chamber umbrella to develop and administer programs targeted towards 1) area high school students preparing them for the workforce and encouraging members to hire locally; 2) internships aligning college, college bound and trade school students with local businesses and; 3) scholarships for college, college bound and trade schools students. 5. We will integrate an online training and education capability into our website for members covering a myriad of business related topics. Our connections make us who we are. Cooperative alliances between businesses increase growth, revenue opportunities, creates additional value for clients, facilitates new introductions and referrals, fosters the exchange of ideas and serves as a problem-solving forum. Joining together those with shared business interests alongside government and civic organizations creates multiple, flexible, collaborative networks that benefits both community and business. Our objective is twofold. First, we must proactively attract new business members from select community and business segments that fit our area’s needs. Second, we will initiate events that provide for positive networking among all Chamber members, local civic organizations, and government to ensure timely and accurate situational awareness. 1. Working jointly with the Director of Community Engagement and Marketing, create and publish a quarterly area community events calendar posted on the Chamber website. This calendar will include scheduled government meetings and events, civic organization meetings and events, and Chamber meetings and events. 2. Arrange for bi-monthly guest speakers from throughout the community at scheduled Chamber meetings. 3. Host a semi-annual legislative breakfast meeting. 4. Host an annual Area Business Alliance Summit. 5. Develop a President’s coalition to meet on a semi-annual basis. 6. Establish and promote the area Preferred Provider Network. 7. Actively pursue and promote the Member-to-Member discount program. Download "Packet- Chamber Packet-membersr discount to member discount 4.pdf"
Offer special deals to your fellow Chamber members. Download here to find out how. To see Member to Member Discounts, visit the Our Members page. 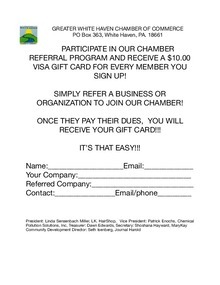 Download "Chamber membership offer copy,count to member discount copy 3.pdf"
Download this form to refer a member—receive a gift card when they pay their dues. 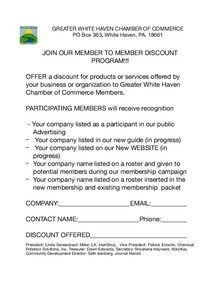 Download "Chamber membership offer copy,count to member discount copy 2.pdf"